According to the latest opinion polls, over 46% of the population believe there should be a new political party. Poll ratings for Independents have been consistently around 20%. The political system of two right-wing parties representing the same interests, taking turns at government, propped up by Labour or another diligent stooge, is coming under attack. The low turnout, at 38%, in the Meath East by-election is the latest indication of this, suggesting an appetite for fresh, radical thinking. For ‘Fianna Gael’ Meath East will prove just a blip. For the wealthy owners of the media, this is an appalling vista. Rupert Murdoch is a media mogul only. Denis O’Brien is a media mogul, with substantial other commercial interests, which benefit from a friendly government in power. They have interests, in media, and beyond. Low corporation tax, kid-glove treatment of tax exiles and outsourcing of government contracts are all baubles expected by our voracious big-business interests – it would be a shame to break up that party. So the system allows the hired hands of the media to sit in the Dáil press gallery, with free offices and car-parking, a subsidised restaurant, and access to the government, as long as they play the game. And play the game they do! The uniformity of journalistic opinion and approach would make a Stalinist dictator blush. And so when Róisin Shorthall deployed the uninspired terms “ragbag” and “motley crew” to undermine the raft of United Left Alliance and independent lefts that were elected in 2011, exposing Labour’s betrayal, the media happily obliged and adopted this slant. 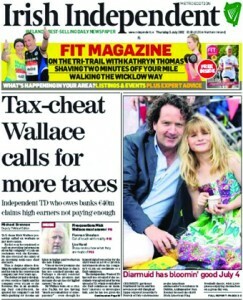 When the Campaign against the Household Tax gathered momentum, the media contrived a travel-expenses controversy, feigning outrage that TDs were spending their allowances travelling the country to build the campaign. Where was the examination of those (non-Independent) TDs who claimed the same amounts and yet said they only operated in their constituency? Where was the praise for not being a parish pump politician, for taking our national mandate seriously and sticking to our election promises? This is not just lazy journalism. Newspapers have always played a propaganda role reflecting the ideology of their owners. They make little effort to, even occasionally, assess actions that are fully intended to cross this ideology, on TDs’ own ideological terms. Or even to research ideologies with which they are not fully comfortable, or acquainted. If you are different and challenge the system, then you are a legitimate target. Nowhere was this more apparent than the leaking of information of my arrest on suspicion of drink driving earlier in the year. That this information appeared publicly at a time when I had raised questions about the quashing of penalty points by high-ranking Gardai was not a coincidence. It was an attempt at intimidation using the press to send out a message to anyone who dares to question the status quo. As Ireland’s Digital Champion, Lord, (formerly film director David) Puttnam said in response to the Leveson inquiry, which unearthed what he called a “toxic triangle of media, politicians and the police”, “once those relationships are corrupted the game is up for the rest of us”. 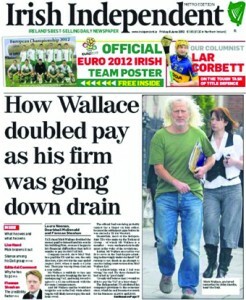 When Independent TD, Mick Wallace, stated that his company had under-declared VAT and that the settlement he subsequently reached and was honouring with Revenue could not be continued as the banks appointed a receiver on the company, he became a “tax cheat”. Clearly he should not have under-declared the VAT and he accepted that it was wrong. But there are many TDs, former and serving, who have serious issues to answer in terms of their business activities yet they are not defined, comprehensively and permanently, as “tax cheats”. Paraded on the front page of Independent Newspapers for weeks on end, he was rarely featured without a picture of me, his “close friend”. This mix of sensationalism and jaded innuendo exposed a lowering of media standards and a wider agenda to discredit the idea of an alternative being possible. When the media talk about the clothes that people wear in the Dáil, and ignore the serious issues they raise, it is because they are afraid that those ‘respectable’ politicians in tailored suits who have served this country so well might find that their days are numbered,. That maybe those ordinary people who are paying the price of austerity and see their living standards devastated might actually start voting for alternative candidates, despite all the media’s best efforts. It is not far-fetched: after all, Beppe Grillo won over 25% of the Italian vote while refusing to engage with the mainstream media. The mainstream media’s venom reflects the fact that, like the political establishment, they are losing their grip on the hearts and mind of the public. The heyday of the media baron, just like the heyday of Civil War politics, is past.